Silver Goggles: Introducing: The Cultural Imperialism Bingo Card! Introducing: The Cultural Imperialism Bingo Card! I'm pleased to be part of the launch of the Cultural Imperialism Bingo Card, designed by Aliette de Bodard, Joyce Chng, Kate Elliott, Rochita Loenen-Ruiz, @requireshate, Charles Tan, @automathic and @mizHalle. Launch orchestrated with the help of Zen Cho and Ekaterina Sedia in addition to above authors. I've talked about cultural appropriation here a lot, and neocolonialism as well, and neocolonialism can manifest in the form of cultural imperialism. 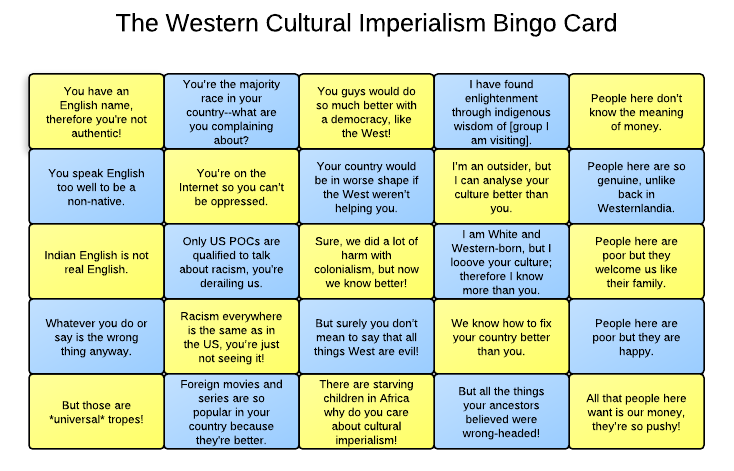 I could talk at length about this, but if you were wondering what are some general sentiments that cultural imperialists spout, here is a handy dandy Bingo Card for you to play with the next time you're watching a discussion about the Third World had by (usually white) First Worlders unfold before your eyes, whether online or off. Strike any statement that comes close and see how long it takes for you to get Bingo! I should probably add that all the statements in this card, we didn't have to make up. Most of us have seen these sentiments in comments sections, or just said outright to our faces. It's pretty incredible, yea? Not, not really. Sigh. As someone who "failed Steampunk" (my words) because I opted to incorporate Raj India only to be kicked out of a photo shoot for not being English enough, I garner much comfort from this bingo card. Thank you. Ahahaha, what? And you in Toronto, even? Email me the details; I want to know! The Steampunk Postcolonialist at SF Signal!